About | San Antonio Hills Inc.
San Antonio Hills, located in Santa Clara County, California is a beautiful community with charm and elegance nestled between Foothill Expressway and the Open Space District nature preserve. 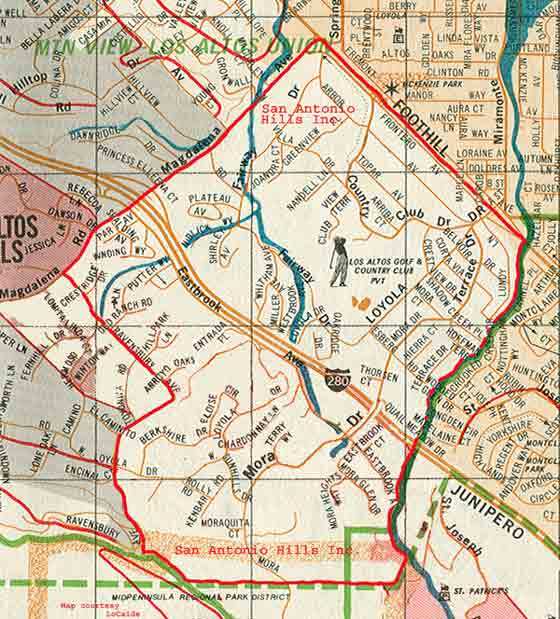 The San Antonio Hills Inc. is the association for residents and land owners in the Loyola / Country Club neighborhood, adjacent to Los Altos and Los Altos Hills. The San Antonio Hills Inc. Homeowners Association was formed to provide a voice for the community. It is through this organization that issues are addressed at the local, city, and county levels. This organization insures that the Covenants, Conditions and Restrictions are considered in new construction, as well as remodeling in accordance with County regulations. The Association also looks out for the welfare of all residents through its focus on roads, parking controls and bicycle safety. The homes within the boundaries in red are included in San Antonio Hills Inc. There are approximately 1125 homes in this over one square mile that may be accessed by a combination of public roads and private drives. About 150 (fourteen percent) of these homes are located in the City of Los Altos Hills. The deeds of the majority of these homes contain CC&Rs that remain enforceable and in effect, and are administered by the Approval Committee, which is part of the Board of Directors of San Antonio Hills. San Antonio Hills Inc. was established in 1941 and incorporated in 1947. The Association operates to assist home owners in the area. There are a number of issues that may need the assistance of the Association. See our History for more details on how the organization came about. Read our FAQ for answers to frequently asked questions. For more information about joining the organization, see our Membership page.